At Superheroes Central we have looked around and found some of the best authentic and realistic Spiderman costumes for adults that are for sale/you can buy. While we appreciate all the suits in the movies, we have focused on just the best ones you can buy online. Below we have compiled some of the best Spiderman costume ideas for the adults based on many factors including appearance, price and positive reviews, we included a quick and easy costume aswell more familiar costumes based on his classic comic book appearance and of course the more modern costumes from the movies as well as a black Spidey costume, because sometimes you have to give the fans what they want. While that may be true that people love Spiderman because of the relatability, I think many people would just argue it’s because of his cool powers I mean we’d all love to be super strong, super agile, climb walls and have an innate danger sense, but maybe it’s because of his even cooler costume, I mean you can’t see who Spiderman is, he could be any age or any race, in short he could be any of us. Spiderman’s costume has rarely changed over the years with most movie adaptations, comics and cartoons staying very faithful to the original. The most notable exception to the rule was the introduction of a mono black jumpsuit and mask, emblazoned with a white spider logo on his chest in the comics, some fans were incensed calling it sacrileges and it wasn’t long before the costume was written out, albeit with some flair and drama, because in actuality the black and white costume was an evil alien symbiote who would eventually become the super villain and Spidey nemesis Venom. Of course. It is the comics after all. 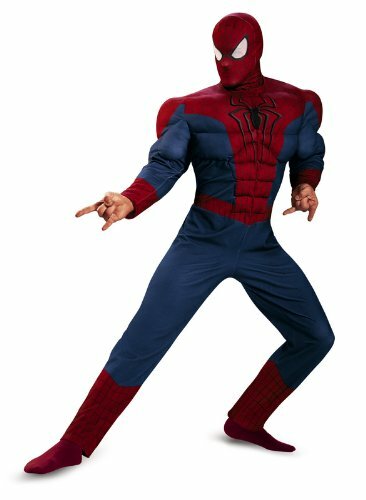 This Spiderman costume is the best one for those men who are super serious about their superheroes , and want to spend whatever it takes to impress their friends with an amazing Spiderman spandex costume at parties or comic conventions. So this is a serious costume for serious money, of the people who bought it and reviewed it, one overall theme ran though the commentary and that was, you get what you pay for, although some people weren’t happy with some of the features of the mask, such as the eye lenses being difficult to see through, and the nose holes because they don’t look right Customer reviews were very positive with most citing the robustness of the material and the fact that it was a great fit, made from a high quality spandex material this is a super authentic Spiderman costume. So if cost isn’t an issue, and you want the best cosplay Spiderman costume, than this outfit is worth serious consideration. This is an authentic amazing Spiderman costume, because lots people have really gotten to know and love Spiderman from the many Hollywood movies he has appeared in over the last 15 years or more, so if you are a big fan of either the Toby Maguire or Andrew Garfield films than this costume could be for you, modeled after the design seen in the two Amazing Spiderman films. 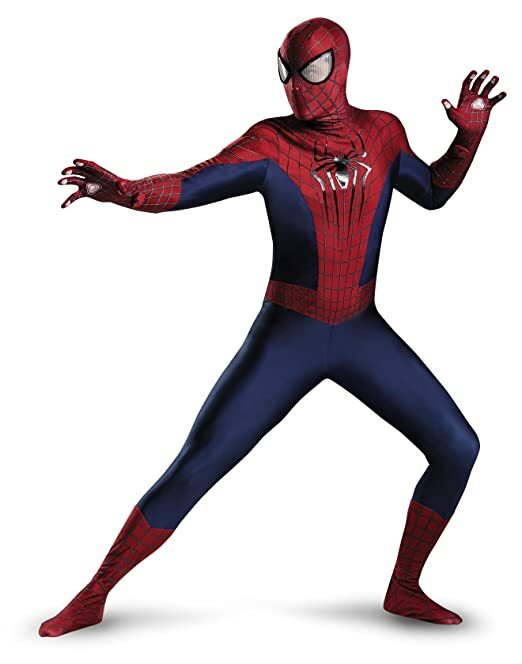 It is another modestly priced tightly fitting costume that people thought was great, with most of reviews being very positive, so if you have a lean build and are not afraid to let it all hang out there and love Spidey from the movies, grab this polyester and spandex blended second skin costume. It is definitely one of the best amazing Spiderman costumes out there. So guys if you are a big fan of Spider-man from the comic books, and have a trim taunt and terrific figure but don’t want to spend too much money then this realistic Spiderman second skin costume is the best costume for you. Of all the outfits we researched this one had by far and away the most reviews and they were overwhelmingly positive, people just loved it. 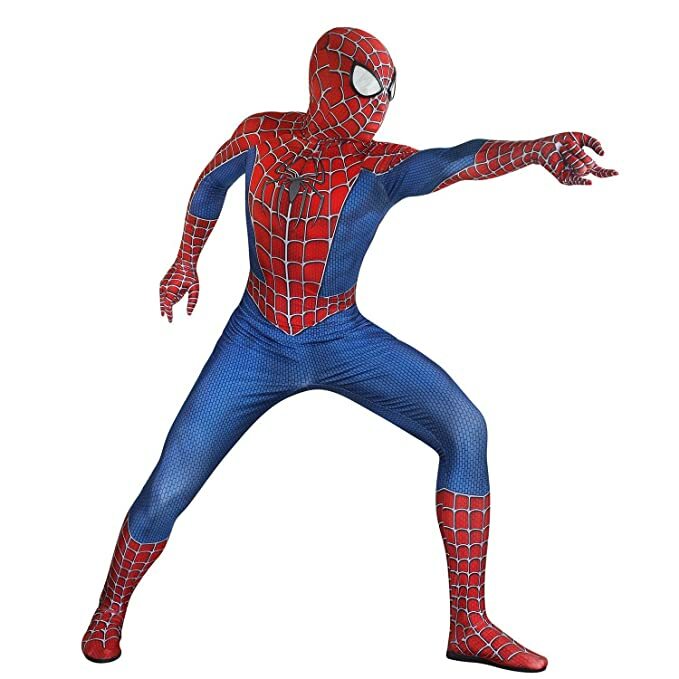 This replica Spiderman costume is a skin tight outfit made from polyester, based on the classic Spider-man look from the comics, it is definitely an outfit for men who are very comfortable with their physique, very reasonably priced and very authentic the only point worth mentioning is that customers said that the sizes ran a little small when ordering, something to bear in mind if you get this one. This authentic black Spiderman costume for adults is the best one for a certain type of Spidey fan. Spiderman has been around for a very long time and his costume has stayed pretty consistent through the years, with one very big exception, and that is when Peter Parker discovered and began to wear the alien symbiote costume. Which as it was, turned out to be a very bad idea as it began leeching his worst emotions and attributes bringing them to the surface making the friendly neighbourhood Spiderman, well somewhat less friendly. Peter Parker rid himself of the costume, but it was too late as it had absorbed darker elements of his psyche and mimicked some of his abilities and when it found a new host(Eddie Brock) it became the supervillain Venom. But hey we all make mistakes, right? 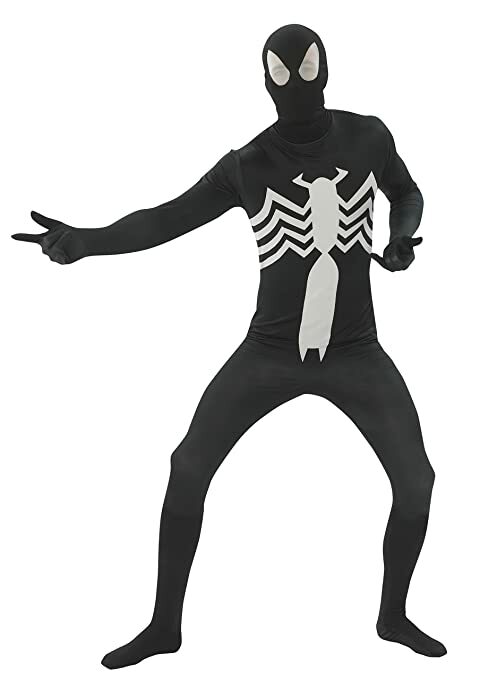 Lots of Spiderman fans(and of course Venom fans too) really loved the simple black white costume, and so it’s partly due to their requests that we have added the best black Spiderman costumes for adults here so you have every option to choose from when buying the right costume for you. Made from completely synthetic materials it is a form fitting black jumpsuit with a detached hood and has huge white spider emblazoned on the chest, it comes in an assortment of adult sizes so no problems there. Lots of people reviewed it, and it overwhelmingly received positive reviews, with most commenting on how good of a fit it was(you should really check out some of the awesome photos people shared in the review section, the image below doesn’t do it justice) . So if you are a fan of black Spidey or Venom looking for the best black Spiderman costume then this is it. This real looking ultimate Spiderman costume is awesome. Everyone loves Spiderman right? And why not he’s super strong, climbs walls and all that, and his costume is pretty damn cool. Everyone wants to go a party dressed as Spidey, great. But for some of us that may not be a great idea in a traditional authentic looking costume, because to put it bluntly, Peter Parker fights crime for a living and that has left him in very good shape. for us adults in the real world we may have a few bumps in the wrong places and a few extra pounds that we could really hide, something a second skin costume won’t allow. The beauty of this costume is that it is not a fully form clinging bodysuit, but has foam muscles sewn in to give those of us who need a little help a more real looking heroic physique. The bodysuit is made from both polyester and spandex and has received lots of positive reviews from customers, and is a fantastic choice for those men who don’t want a super clingy Spiderman costume. One thing to remember though it doesn’t come with gloves or boot tops and they will have be to ordered separately if you want them. 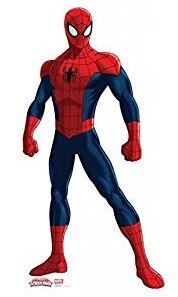 but for the average out of shape guy this is the best ultimate Spiderman costume. 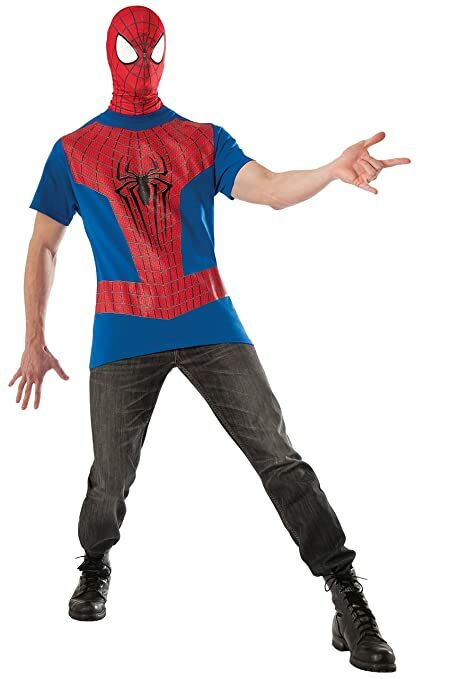 Sometimes as an adult you want to be a part of the fun without all the hassle, and that’s what this cheap Spiderman T-shirt costume offers, a quick easy way to a part of things. It is very affordable and received an overwhelming majority of positive comments from customers, who loved the quality for the price and were happy with the fit of the shirt and were very impressed with the fit and style of the mask and had very few problems with vision out of the eye lenses. It is made from polyester and comes in a variety of sizes for men. Overall the best choice for a casual cheap costume for a friends party. If you’re on this page, then like us you’re probably a huge Spiderman fan. And if like us you probably remember thinking when you were a kid that you wished they’d bring Spidey to the big screen. Than like us you’re probably really enjoying the amazing Spiderman’s evolution on the big screen. He just seems to be going from strength to strength. He’s a short video showing the best authentic and realistic Spiderman suits and some behind the scenes inspirations that go into the awesome onscreen costumes. Enjoy. So we’ve showed you some great adult sized costumes, some suitable for casual people, or portly people and other outfits suitable for those who have the athletic build to pull off a clingy Spiderman costume, all of these have one thing in common, they are for people who want work within a reasonable budget, and they are all great value for money. I love Spiderman, and I have always wanted a Spiderman costume, but I have never been able to find one that does him any justice.Yes, I am a bit picky. Sadly, when I found one that came close, I didn’t do IT any justice, so I guess I can’t really complain that much. Hey Ossur, thanks for dropping by. What do you mean you couldn’t do the costume any justice, your Peter Parker in disguise right!. Yea it totally slipped my mind on the Black suits, will be on the look out for your immediately. Thanks for the reminder. I really like the look of the Amazing Spiderman Second Skin Costume the best I think. I run a Saturday children’s club and we run monthly theme. Next months theme is…. you guessed it, Superheroes! So here I am looking for Spriderman costumes (I love my job) Do you have a favourite online supplier of customers that you recommend? Hi Simon, can we come to your Superhero themed party? Would be awesome. Like many things, I believe Amazon to have the best prices and you can’t beat there fast shipping. Thanks for stopping by. Hello and thanks for sharing, I guess there is still a kid inside all of us even as adults. These spiderman costumes for adults is really cool. Spiderman is one of my favorite cartoon characters, I spent many days just sitting down and watching him swing around the city doing so much good. I am sure that your readers will love what you are offering. Thanks Norman, Spiderman is my Son’s favorite Superhero and he loves it when we both dress up like the man himself. Great bonding times. Wow really glad I ran into this post. I have also been a fan of superhero and especially Spiderman. I also liked how you wrote so detailed yet so simple to understand and digest. I am really thinking of buying and are these costumes actually very warm when worn? Thanks! I wouldn’t wear them as winter suits, perhaps over the top?. I’ve always been a huge spidey hero before the movies were even released. I just wished I had dressed up as Spiderman at fancy dress parties in the past, especially now seeing the costumes on your page. I’d definitely choose the last Spider outfit. But do you know if black Spiderman costumes are available too? HI Neil, your never too old to dress up like your favorite superhero!. Age is just a number after all. Black SpiderMan costumes are in the making. Stay tuned.